Since we waited a week to go on our honeymoon (such a good decision on our part) we simply went back to our “new” house together after our wedding reception. We got come criticism from others for not going to a fancy hotel — but at the time, we both just wanted to “go home”. Now, almost 13 years later, we still both love being home! Anyway… back to my pancakes. Aside from grilled cheese around 1am after we walked in the door from our reception, pancakes were the very first food I made Dave after we were married. To this day, they are still one of our favorites! If we want a quick breakfast to please the entire family, pancakes are it. If we want a special birthday breakfast treat, chocolate chip pancakes with whipped cream fit the bill. 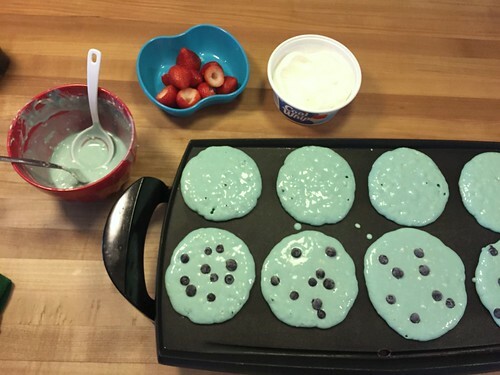 If I want to surprise the kids with a festive holiday breakfast, pancakes + food coloring is always my go-to meal (tie-dye swirls are their favorite). 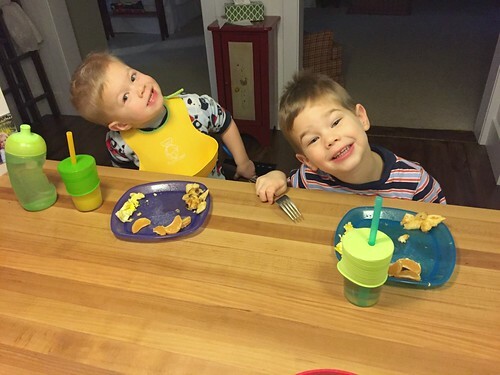 If I need an easy finger food for a toddler, pancakes (without syrup — too messy) are one of my favorites. 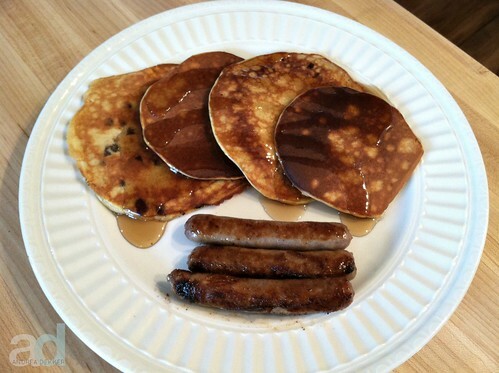 If we’re on vacation with limited cooking resources, pancakes (from a boxed mix) are calling our name. 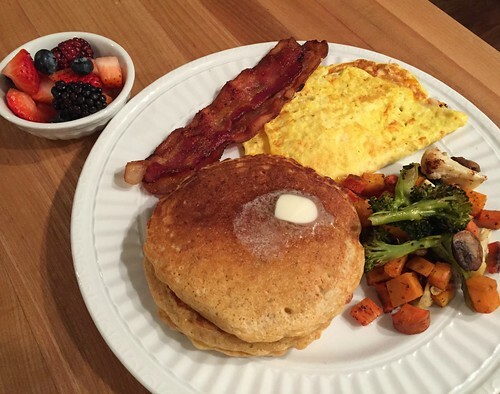 If we’re running short on time and have to change our dinner menu, pancakes and eggs is our fall-back. If I want a “fancier” brunch pancake, I make puff pancakes. Over the years, I have drastically changed the ingredients I use to make pancakes. 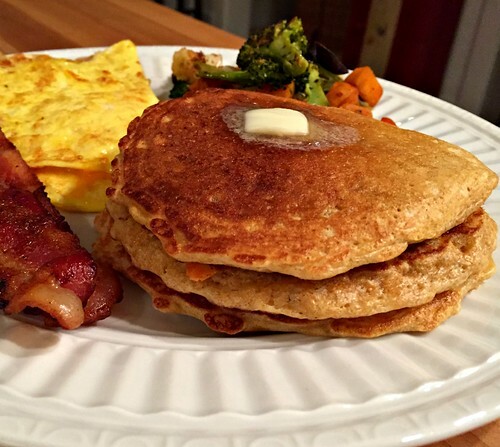 I started using Bisquick for everything, then switched to a basic homemade recipe, then eventually healthified several of the ingredients, and then started incorporating white whole wheat flour a couple years ago. For the last 4 months, I’ve taken my pancake recipes to a whole new level with freshly ground grains! 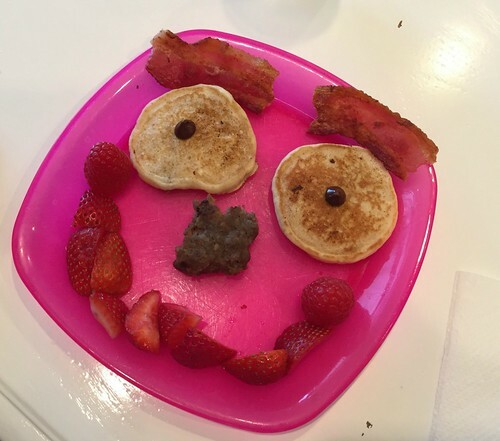 It took me several tries to figure out how to get the right consistency, but I now have 3 different (equally amazing in different ways) 100% whole grain pancake recipes that our family enjoys every single week. 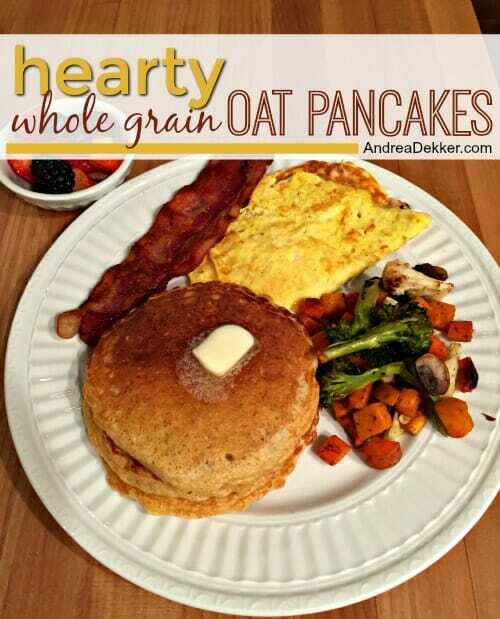 Today, I’m sharing our family’s top favorite — whole grain oat pancakes (and no, you don’t need to use whole grain flour if you don’t have it in the house)! Makes roughly 15 small to medium sized pancakes. 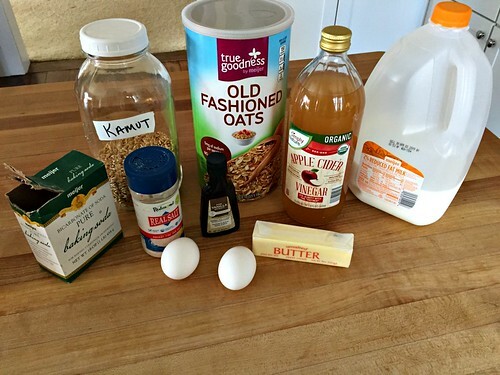 *Any type of milk should work… or you can sub equal amounts of buttermilk for the vinegar and milk. I just never keep buttermilk in the house. **I use 130 grams of freshly ground Kamut or Soft Wheat, but any type of Whole Grain, Whole Wheat, or All Purpose flour will work. Gluten free flour should also work — I’ve made it before using 1 c. oats and 1 c. oat flour. *** I usually use butter, but I’ve made them with vegetable oil, olive oil, melted coconut oil, and even bacon grease — all with fantastic results! In a large bowl, mix vinegar and milk. Let sit for 5 minutes, or until it looks thicker (this is essentially creating buttermilk or “sour milk”). Stir in flour and oats and let sit for 5 minutes again — just to let the flour and oats absorb some of the moisture. If it’s too thick for your preference, add more water or milk. If it’s too thin, add a little more flour. NOTE: I do these first 2 steps the night before and let the flour and oats soak all night long on the counter, but that is not necessary. 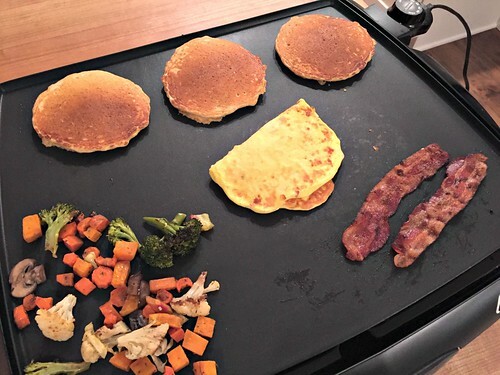 Preheat griddle or frying pan over medium-LOW heat (melt butter in the pan or spray with non-stick spray). Pour 1/4 c. worth of batter for each pancake and let cook until bubbles start to form on top of the pancakes (these pancakes take a bit longer to cook than others I make). Carefully flip and cook for 2 minutes more, or until fully cooked through and quite brown on the outside. Serve immediately with maple syrup, or cool on wire racks and refrigerate or freeze for later. See how much thicker it gets after sitting for 5 minutes! 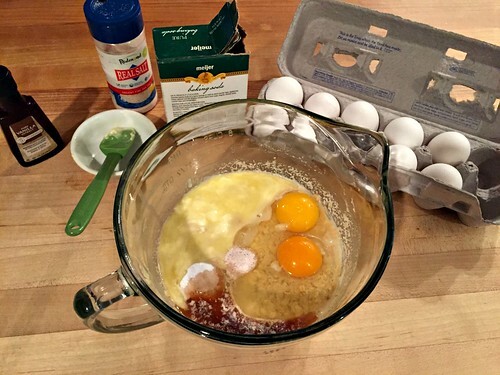 I add the rest of the ingredients in the morning, just before making the pancakes. The photos below are darker because they are taken very early in the morning when I’m making breakfast! Dave and I agree that these pancake are some of the best pancakes we’ve ever had (and we’ve eaten A LOT of pancakes in our day). They are slightly crisp on the outside while still being super soft and fluffy on the inside. Plus, they are PACKED with whole grains. As I mentioned above, you should have success with almost any type of flour, any type of milk, and any type of fat, so you really have no excuse not to give these a try — no matter what type of food plan you follow or what types of ingredients you keep in your pantry! 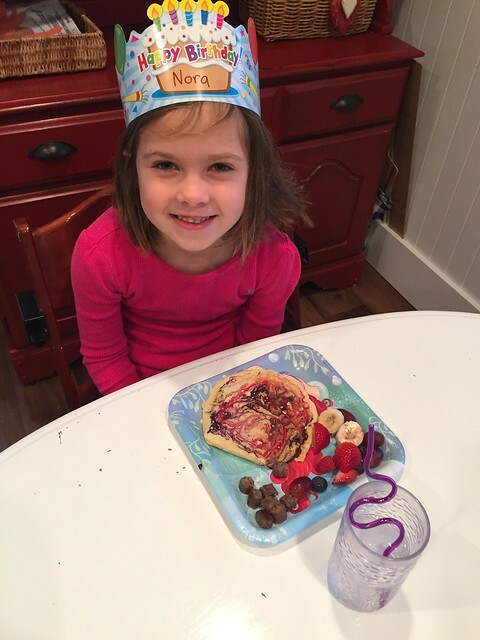 I could probably share a new pancake recipe every month for the rest of the year… but since I know not everyone loves pancakes as much as our family does, I won’t! However, I’d love it if you shared some of your favorite pancake recipes (or “secret” ingredients). My Old fashion Oatmeal pancake recipe is very simuliar to yours and I do soak overnight. You might try adding some Pecan Meal, I add Pecan Meal to cooked cereal, cookies, pancakes and etc. I love the nutty taste. yum… Thanks for the tip! 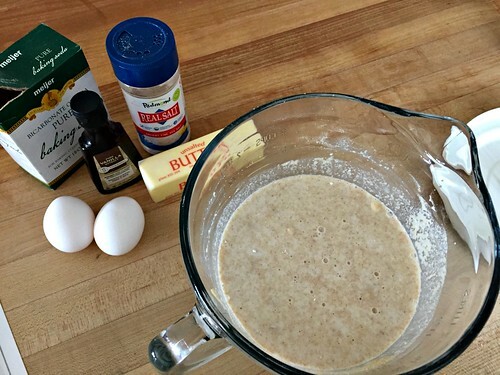 I’m a little late jumping into the pancake conversation, but thought I’d mention one of my favorite “secret” add-ins to pancake or waffle batter … 1-3 T of ground flax. Really boosts the nutrition factor. thanks Lauren! 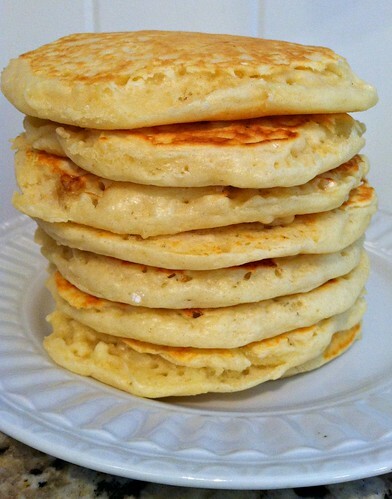 I’ve been known to add some ground flax to our pancakes and waffles too — it really thickens up the batter nicely! As for my secret ingredient for my whole wheat pancakes–1 tsp of vanilla. Adds just the right amount of sweetness without adding more sugar (I sweeten them with 1 Tbs of honey). I’m super-excited to try your recipe! Pancakes tend to make me feel sleepy and a bit sick to my stomach when eating them on an empty stomach (too much carbs not enough protein I guess). Then I tried ricotta pancakes and it made a huge difference to have protein added to the mix. The ricotta adds creaminess and makes them fluffy and delicious. I’ve even added it it to boxed pancake mix. If you add too much it can make them wet. There are many recipes out there but I just eyeball it. 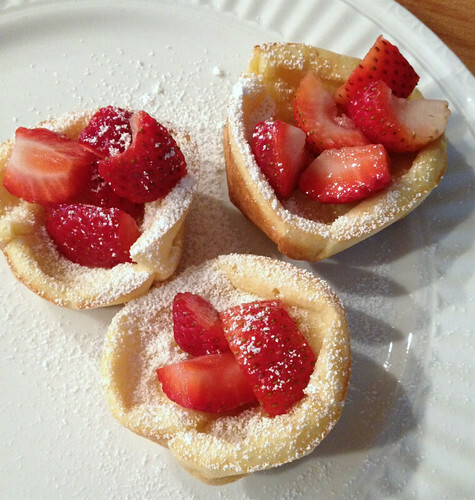 You can also use lemon zest and dust them with a little confectioners sugar. So good! oh yay — thanks for sharing! 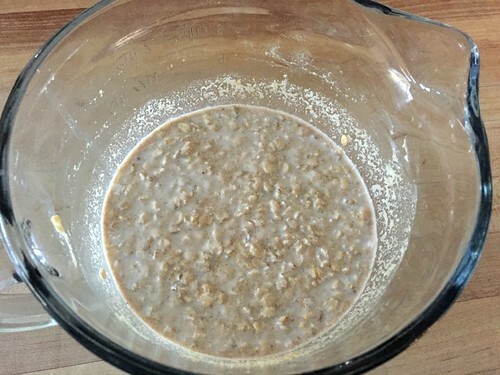 I love the idea of soaking the grains overnight…makes it that much easier in the morning! Does the milk do ok on the counter all night? We will totally be trying these, probably tomorrow! yes, soaking makes the oats softer and the batter thicken up nicely! The milk is fine, as long as you add the vinegar. You can also use plain yogurt or whey! 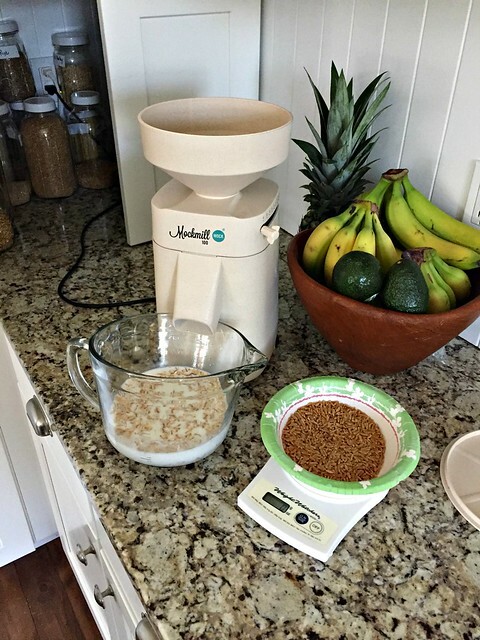 Where do you purchase your whole grains for grinding? 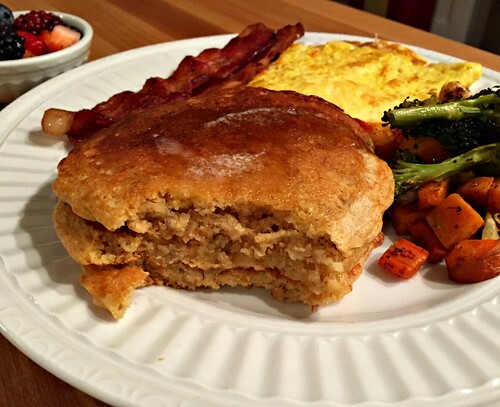 Here’s my recipe for vegan Pumpkin Pancakes. In a mixing bowl, whisk flour with baking powder, pumpkin pie spice, and salt until well combined. Stir in pure pumpkin, nondairy milk, and sugar if using. If needed, add water to thin out batter to desired consistency. Meanwhile, heat a nonstick skillet. When a drop of water fizzles on the skillet, it’s ready. 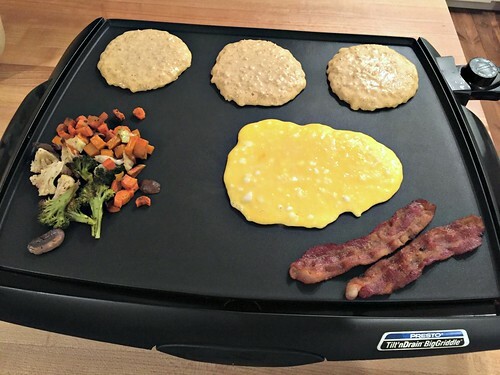 Turn heat down to medium and pour pancake batter into skillet, 1/4 cup at a time. Cook on one side until bubbles form, about 2 minutes, then gently flip it over and cook another 2-3 minutes. Repeat until you are out of batter. Dip in maple syrup, if desired. all food posts make me hungry! 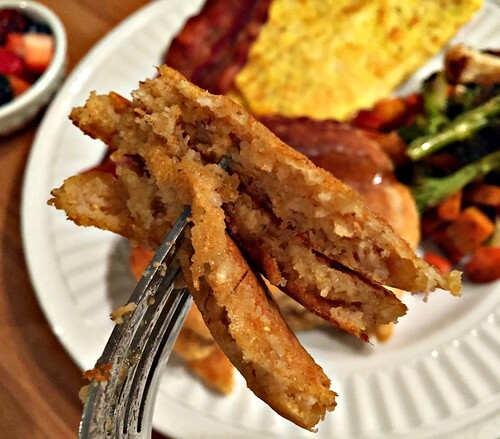 Someone else just left a recipe for Vegan pancakes (egg and dairy free!) You could give those a try! I love blueberry pancakes! I’d like to share a special occasion recipe. My son loves this. I just bought the little single serving cheap frozen cheesecake (maybe Edwards? ).